It’s often said that putting is the most difficult part of the most difficult game in the world. Add to that the fact that it’s arguably the most important, and you’ve got a recipe for frustration. Practicing your putting is a vital component to becoming a better golfer, and one of the best ways to regularly do so is to purchase an indoor putting mat. It might not perfectly replicate the green you’ll be out on on a Saturday, but it will come pretty close, and give you a lot more opportunity to practice with the flat stick. 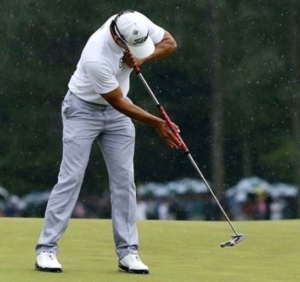 Put simply, your putter is far and away your most used club. As PGA Professional Mark Blakemore says, the par score on any given hole is based on two putts – roughly half the total shots taken on the hole. Some might dispute that it’s the single most important aspect of your game – legendary coach and wedge master Dave Pelz, for one – but few would argue that it isn’t right up there. Despite that, most golfers are more inclined to spend time working on their longer clubs, even though they hit them significantly less – one of golf’s biggest problems, if you believe St. Andrews head pro Dave Erikson. So why do so many amateurs make this mistake? Perhaps Bobby Locke, former South African professional golfer, summed it up best when he coined the phrase, ‘You drive for show and putt for dough’. Being able to consistently drain a six-footer or two-putt from distance might not seem as impressive as being able to crunch your driver 10 yards plus your playing partners, but it’s probably far more important. It’s straightforward enough – if you have an indoor golf mat readily available to you, you’ll practice your putting more often. Very few people will head to their local club to practice putting. If you’re going to make the effort to pack the clubs into the car and drive down there, you might as well whack a few woods, right? 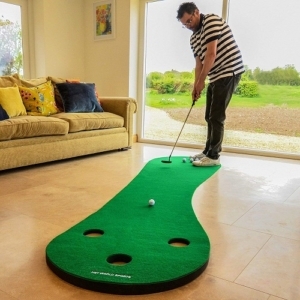 Having a golf mat inside your house takes away that problem, enabling you to spend a few minutes every day practicing your putting from the comfort of your own home. You might not get the practice reading greens or adjusting for different speeds that you would with the real deal, but the amount of time you’ll put into developing a consistent stroke will take numbers off your final score. What kind of golf mat should you buy? Golf mats come in many different shapes and sizes, and there is no ‘right’ kind – it depends on your individual situation. If, for example, you’re lucky enough to have a huge space in which to lay down your golf mat, there are plenty of big mats – greens is probably a more accurate description – for you to practice on. If you have this luxury, these are great – they mean you can practice putts of various length to more closely replicate the situations you’ll face on the course. For most people, the amount of room they have inside for a golf mat isn’t significant, in which case a smaller mat which can be easily put away is more appropriate. You might worry that a smaller mat doesn’t let you practice the longer types of putts you’ll be facing a whole lot on the course, but remember; a short putt is worth just as many strokes as a long drive, so you don’t want to be missing them. Even a small mat allows you to work on this important skill, and enables you to practice techniques such as this one, as offered by legendary coach Butch Harmon. If you want to get fancy, there are plenty of golf mats which provide slopes and inclines, as well as various holes. These are great, as they enable you to practice a variety of different putts. If you don’t have the space or the budget for something like this though, there’s no need to worry – the main point is to develop a stroke that enables you to putt with confidence. There are endless resources – be they online, at your local golf club or simply via advice from someone who knows – to help you become a better putter. For example, this Golf Digest article uses examples from real Tour professionals that are easily transferrable to anyone’s game, regardless of handicap. Having a golf mat enables you to put these tips into practice every single day. It’s easy to see how that will help you to shave strokes off your scorecard. Golf is a game consisting of many parts, and there’s no one individual skill that will take you from an average golfer to a brilliant one. You need to be at least reasonable at all facets of the game to do that, but if you’re like most people and simply want to hand in a scorecard at the end of a round with a few less strokes on it, then one of the best things you can do is to improve your putting. Unfortunately, despite this being fairly widespread knowledge, most people don’t put it into practice, instead preferring to practice belting the ball wildly down the fairway. A golf mat will help you avoid this trap. It will enable you to implement tips and techniques to actively improve your putting, something which will translate to the golf course and have an immediate impact. Go back over your last round, and think about all the shots you left on the course because of missed short putts or three putts. 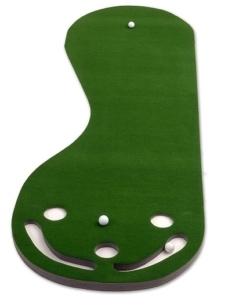 Imagine them wiped off your scorecard – that’s what a golf mat can help do for you.